Howard believes Vatican holds grudge; priest says Church barely aware of "Angels"
(CNN) -- If director Ron Howard hopes religious controversy will help sell tickets to "Angels & Demons" the way it boosted his "Da Vinci Code," the Catholic Church is not playing along with his script. 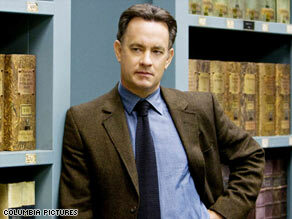 Tom Hanks reprises his role as professor Robert Langdon in "Angels & Demons." Howard, who premiered the follow-up in Rome, Italy, this week, said there was "residual antagonism from 'The Da Vinci Code,' " but Vatican officials ignored the movie by not responding to suggestions that the church was offended. The first movie based on Dan Brown's mega-selling novels earned $750 million worldwide in 2006. "The Da Vinci Code" was intensely criticized by Catholics, especially those from the Opus Dei organization, a small but influential group within the Catholic Church whose members felt that they were vilified in the story. "To be honest, I don't think that anyone at the Vatican is paying much attention to the premier of the 'Angels & Demons,' " Father John Wauck said. "I was just talking with some people yesterday, I know friends of mine working in the Vatican, and they were surprised to learn that the movie was premiering in Rome. They had no idea." "I think the church's attitude has been, from the beginning, 'hands off,' " Wauck said. "Especially, I think, after what happened with 'The Da Vinci Code.' "
The new movie is not as offensive, Wauck said. "In 'The Da Vinci Code,' there were serious issues, such as who Jesus Christ was or the nature of church in the course of history, but none of them is taken in 'Angels & Demons.' It's simply, you know, a thriller," he said. The movie may even help Rome by promoting tourism there, which is "not a bad thing," Wauck said. But Howard suggested to CNN's Neil Curry that controversy has carried over to the sequel. "I think there's some residual antagonism from 'The Da Vinci Code,' " Howard said. Stirring people up with controversy is "something that appeals to me," he said. "Part of the entertainment value is that people are going to go in there and have something to talk about or think about afterward," he said. Howard said he tried to reach out to the Catholic Church. "We've even invited certain groups, members of the church, for example, to see early rough cuts, because I wanted to share it with them and know what they thought, and I felt they'd find it not as offensive as they'd imagine," he said. "Everyone's declined to do that." Howard himself downplayed reports that Rome and Vatican officials hampered production by refusing permission to film in certain locations. "Probably a little more has been made of that," he said. "While I don't want to reveal how we took people on the 'Angels & Demons' tour and on the adventure, someday I might, maybe on the DVD or something, do a little better breakdown of how we got the shots we needed," he said. Producers did resort to some "low-budget street photography where you just pull up in a car, getting out of a van, clearing a little space and shooting a shot," Howard said. This controversy, Wauck said, was also cooked up by the film's marketing department. "As a general rule, no commercial films are filmed in churches in Rome, and no exception was made for 'Angels & Demons,' " Wauck said. The film, which like "The Da Vinci Code" stars Tom Hanks as symbolism professor Robert Langdon, takes the audience inside the Conclave, where cardinals meet secretly to choose a new pope. "One thing that was important to me and to all of us was to be as authentic as we possibly could be about what Conclave was like, that period when they're trying to elect the pope," Howard said. "It's a complete mystery. Outsiders are not allowed in. They stop rolling even their own Vatican archival footage when they lock the cardinals into the Sistine Chapel." Set designers used old paintings and photos to recreate the scene, he said. "I wanted to represent for the audience that with as much detail as I did going to the moon with 'Apollo 13,' " he said, referring to his 1995 movie about the aborted space mission. "Angels & Demons" is the second of Brown's Langdon novels Howard has turned into a film. "There are so many reasons to do it, and when I really looked at 'Angels & Demons' and realized that it was going to feel different," he said. "It was going to sound different. It was going to be paced in a completely different way because this is a real bona fide thriller. This is Langdon in jeopardy. There's a ticking bomb. You know, it's a murder mystery." Howard said he will wait to decide whether he will make a movie based on Brown's third Langdon novel. "While I haven't read Dan's next installment of the Robert Langdon adventures, I'm dying to," he said. "I'll also look to see how audiences respond to 'Angels & Demons.' They're going to tell us a lot." "Angels & Demons" opens in U.S. theaters May 15. CNN's Neil Curry and Hada Messia contributed to this report.